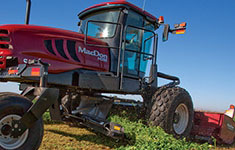 If you’ve been looking for a header that cuts alfalfa at speeds up to16 MPH (26 km/h) and powers through 12′ (3.6 m) of cane or a heavy winter forage crop – MacDon’s R85 Rotary Disc provides all this and more. 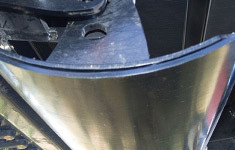 This next generation rotary disc machine has been significantly improved in almost every important area including frame strength, cutting angle, disc pattern, header flotation and conditioning. There’s even MacDon’s new Double Windrow Attachment that allows you to place up to 48′ (14.6 m) of crop into a single windrow by combining three 16′ (4.9 m) conditioned windrows. 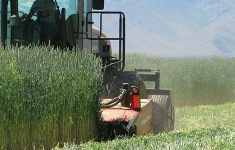 The result is a machine that delivers greatly improved cutting, crop handling and windrow formation, especially in tough, heavy or wet crop conditions. 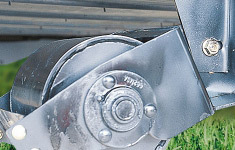 We’ve given the 16′ (4.9 m) R85 an overshot auger to more efficiently transfer crop from the discs to the wide conditioner rolls and improve cutting performance in tougher conditions. 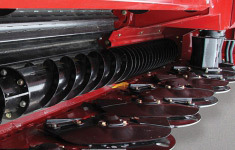 MacDon’s optional Double Windrow Attachment allows you to place up to 48′ (14.6 m) of conditioned crop with the R85 into a single windrow. 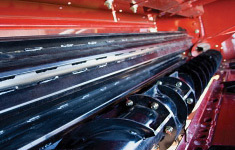 MacDon’s double windrow attachment feature lets you lay up to 48′ (14.6 m) of crop in a single windrow. 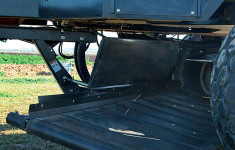 This is ideal for today s large forage harvesters, and can translate into significant time and fuel savings for producers who employ this feature. 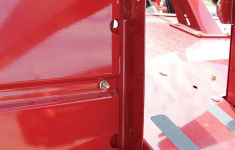 Double Placement 32 ft. (9.8 m) | Triple Placement1 48 ft. (14.6 m) | 1 Triple placement is possible with installation of GPS Auto Steer on your Windrower.